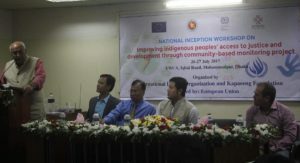 The national inception workshop of the project ‘Improving indigenous and tribal peoples’ access to justice and development through community-based monitoring’ (popularly known as ‘Indigenous Navigator’) was held in Dhaka from July 26-27, 2017.The project is supported by European Union (EU) and jointly implementing by International Labor Organization (ILO) and Kapaeeng Foundation in Bangladesh. 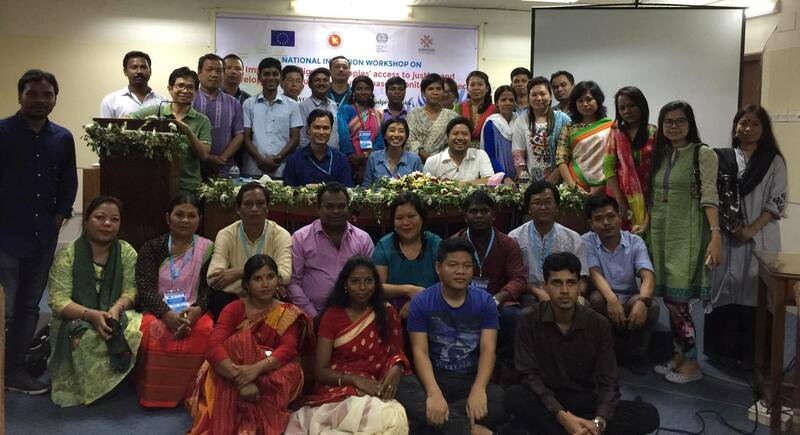 Around forty participants from different indigenous groups and regions attended the two-day long workshop. The project aims to consolidate the Indigenous Navigator framework and related tools and to scale-up capacity building for indigenous and tribal peoples’ communities and networks to use the framework to undertake community-based monitoring. 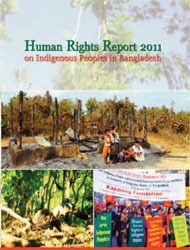 Critically, the project seeks to make available data on indigenous and tribal peoples’ rights and development that is gathered by communities themselves, with the aim to facilitate enhanced engagement and dialogue between them and key national and international actors, and their involvement in national and international processes regarding indigenous and tribal peoples’ rights and development. The inaugural ceremony of the two-day National Inception Workshop was held on July 26, 2017 at YWCA, Dhaka. Mr. ManikLalBanik, Honorable Additional Secretary of the Ministry of Chittagong Hill Tracts Affairs was present as the chief guest at the inauguralsession while Dr. Debapriya Bhattacharya, convener of the Citizen’s Platform for SDG Bangladesh and the honorable Fellow of the Centre for Policy Dialogue (CPD), Mr. SanjeebDrong, General Secretaryof Bangladesh Indigenous Peoples’ Forum (BIPF) spoke as distinguished guests.Mr. Alexius Chicham, National Project Coordinator of International Labor Organization (ILO) delivered welcome speech and presented project brief to the audience, and Mr. PallabChakma, Executive Director of Kapaeeng Foundation presided over the session. 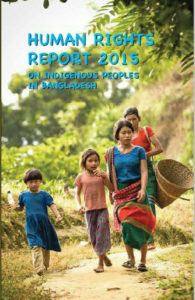 Mr. ManikLalBanik,said-Indigenous Navigator project is new endeavor for indigenous peoples of Bangladesh. 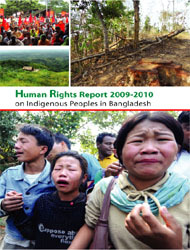 After the CHT Peace Treaty, recent amendment of theCHT Land Dispute Resolution Commission Act of 2001 is an indicator of government’s well-intention to full-fill the treaty. For the development of indigenous people, the government had included the issues of indigenous socio-economic and cultural development in the 7th Five Year Plan (FYP)and now implementing accordingly. Also, he said that specific and accurate information is not always available for development plan of the indigenous people concerns. Government information and statistics department has different limitations but they are trying to overcome all those limitations.This new project of Kapaeeng Foundation and ILO woulddefinitely add values in terms of collecting data and information on indigenous peoples which will be very helpful in the development of indigenous people at the local, regional and national levels, he further added. Mr. Banik assured, Ministry of Chittagong Hill Tracts Affairs would provide all possible supports for the proper implementation of the project. Dr. Debapriya Bhattacharya, convener of the Citizen’s Platform for SDG Bangladesh and the honorable Fellow of the CPD said,SDGs targets have special significance in order to include the voices of the marginalized and their struggle with the main development program. 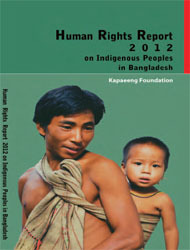 Indigenous peoples would have chance tobenefitfromthe indigenous navigator initiatives if indigenous peoplestruly involved themselves with the main-stream development-flow of the country.He also said that after collecting the specific data and information on indigenous peoples through this project, they can be included in the various policies adopted by the government at local, regional and national levels. 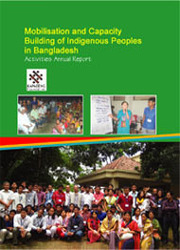 The combinations of data collection through this project and the government mechanisms through Bangladesh Bureau of Statistics could contribute a lot for the development of indigenous peoples in the SDGs implementation phase. However, he requested the indigenous community people not to consider this project as ordinary project only, rather to think beyond a development project. 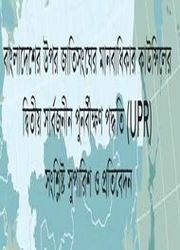 So that community will own the project and get benefit even after phase out of the project. 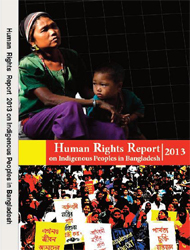 Mr. SanjeebDrong, General Secretary of Bangladesh Indigenous Peoples’ Forum (BIPF) said- the government of Bangladesh does not have accurate statistics of how many indigenous peoples have lost their land in last 10 years. 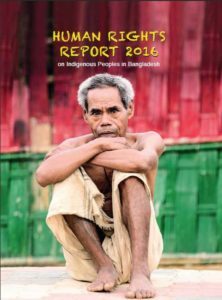 The number of indigenous peoples migrated in the last 10 years is also unknown to both the government and indigenous peoples. Therefore, considering this data gaps, indigenous Navigator’s project would beuseful for both the indigenous peoples and the government for the development initiatives of indigenous peoplesfollowing the national policies. Mr. Alexius Chicham, representative of ILOillustrated thatthrough this project, the indigenous peoples wouldget more opportunity to engage themselves to protect their rights. 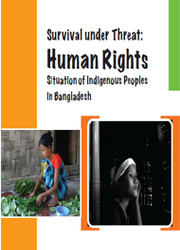 The project would help indigenous peoples to create comparable information through community monitoring on SDGs implementation.Community people would be able to enrich their knowledge through the collected information and this might influence the governmentto formulatenecessarypolicies for the development of most disadvantage groups of the country. In his concluding remarks Mr. PallabChakma, executive director of Kapaeeng Foundationrequested all participants to engage effectively in the project activities and help community to reach out voices to the policy makers through this Indigenous Navigator project. As this project will closely monitor different UN instruments, including United Nations Declaration of the Rights of Indigenous Peoples (UNDRIP), it will find out different gaps of indigenous peoples’ development and engagement in the national development process. He further added, for ensuring ‘Leave no one behind’ in the SDGs implementation processes indigenous peoples should be engaged. 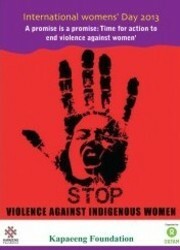 Different data gap analysis through this project would greatly help to engage indigenous peoples in this regards. He also gave emphasis on- monitoring the implementation of SDGs including follow-up and review at the national, regional and global level. Moreover, he sharedhis experiences onVoluntary National Review (VNR) of Bangladesh in High Level Political Forum (HLPF) in UNas well as work experience with the Citizen Platform to monitor implementation of SDGs. As part of the workshop the participants were engaged in different technical sessions and group work to explore their roles and responsibilities as part of the indigenous navigator project.Ms. Joyce Godio from Asia Indigenous Peoples Pact (AIPP) attended the workshop and conducted technical sessions on Indigenous Navigator. The objective of the workshop was to understand the components of the Navigator Initiative, to oriented the participants about indigenous Navigator Framework and tools and relevant international processes and mechanisms including UN and ILO supervisory mechanism and the SDGs follow-up and review as well as to map community developments needs and develop country strategies and action plans.